Fenced In: A Permanent Enclosure for Washington Market Park Lawn? The volunteers who oversee Tribeca's popular Washington Market Park have an important decision to make, and they're on the fence about it, in more ways than one. The group is trying to decide whether to encircle the popular park's lawn with a permanent fence of as-yet-undetermined design. In an 11-to-5 non-binding vote taken at their meeting earlier this month, they supported the proposal, but have yet to reach a final decision. They want to hear more opinions from the community. You can let them know what you think by clicking here. Jennifer Van Zandt, co-president of the Friends group, said she was surprised that she did not get complaints about the fence remaining up last month, when the park held a movie night and three concerts. That led to the idea of installing a permanent, more decorative one. "It turned out that there were some benefits to it," Van Zandt told the group. "It helped parents feel that children were more contained." 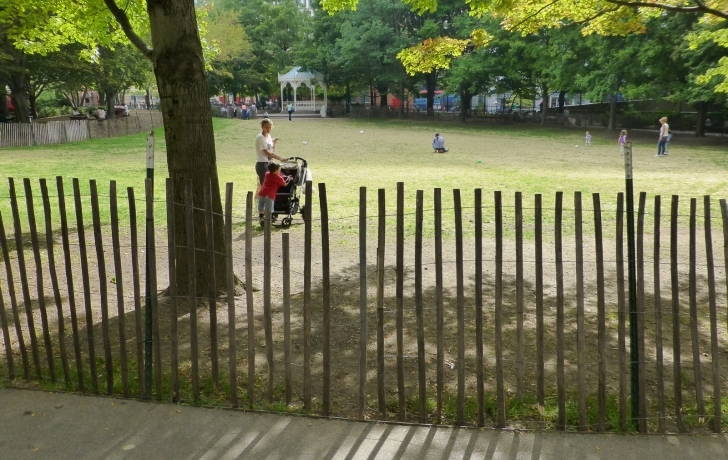 The Friends received a $100,000 grant from the Lower Manhattan Development Corp. and $75,000 in city money from Councilwoman Margaret Chin for the purpose of maintaining the lawn. They are considering whether to authorize the city Parks Department to spend some of that money on a new fence as part of its annual lawn work that begins in January. They say the Parks Department needs a decision by the beginning of next month. If they decide to go ahead with it, the fence installation will be included the Parks Department's scheduled five-month overhaul of the lawn, including the laying of new sod, that will take place between January and May. An initial request for community input on the fence drew 63 responses, and the results were nearly even: 40 percent in favor, 35 against and 25 percent undecided. "Yes. Child safety and better grass maintenance!!" wrote one respondent. "No. One of the beauties of the park is its openness and a fence, however attractive, provides an unwelcome feeling," noted another. Friends member Anne Roy seemed to speak for the majority in the group. "I feel like if they're offering this brand new fence instead of what we have now, maybe we just go for it," she said. "It will probably be very nice and people will be excited that their kids can play inside." But Jonathan Stinnett disagreed. "Most people I talk to say they would rather have rattier looking grass but it's open and people are on it," he said. "I think what people want is space rather than a museum piece."